For cats, sleeping is a full time career and they are not afraid to work hard at it. We explore three ways to identify your kitty’s working style and get them on the path to success in their chosen field! Do you find your kitty passed out on unlikely surfaces or do you have to hunt them down to find the latest hideout? Here’s what you need to think about to help your hard worker not just survive but thrive in the full time napping industry. While summiting any object can be a thrill, only a select few are committed enough to sleep there. For your kitty’s inner wild cat, climbing brings safety, prey and a great viewing platform to monitor household subjects from. If your cat spends most of their time in the imaginary treetops of your home, find some high shelves or nooks to put their favourite blanket on. We are all familiar with the ‘If I fits I sits’ philosophy. If your kitty subscribes to this school of thought, they are probably a die-hard cave dweller when it comes to sleeping. They want a roof over their heads when they snooze – a space to call their own. You will routinely find these guys chilling in your undies drawer or darting out of the cupboard. Save your clothes from all that shedding fur and invest in a purpose built cat cave, or at least put a pillow in the kitchen cupboard. And keep your washing machine door firmly shut at all times! You need the right amount of heating or cooling to do your work well, and your cat is no different. While dedicated guardians may leave air conditioning on for hot days, it’s just not safe to leave the heater on when it’s cold. 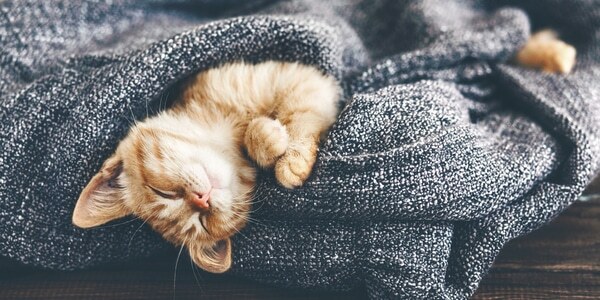 Providing your cat with a smaller, snuggly bed will help them curl up and retain heat more effectively. Why not surprise your hard working furball with a new bed for Christmas? Check out the Kitska sleep range to find the perfect option for your kitty by visiting the Kitska store now. This entry was posted in Cat behaviour, Cat furniture, Cat health and wellbeing and tagged cat bed, Cat behaviour, cat cave, cat furniture, Cat wellbeing.